Everyone loves a holiday with decorations, costumes, and special foods. The Day of the Dead is an ancient holiday that has been celebrated for thousands of years in Mexico and Central America. At the end of October, millions of people acknowledge the passing of their friends, family, and ancestors by visiting graveyards to leave food, flowers, and decorations. Today, the Day of the Dead, or Dia de los Muertos, is celebrated throughout the world—from Spain to Mexico to Denver to Rio de Janeiro. The book Day of the Dead takes readers through the customs, art, and beauty of the holiday. This book is a celebration of culture, history, art, and language. ​The Day of the Dead, or Dia de los Muertos, has been celebrated with many of the same traditions for centuries. Even after the Spanish arrived and changed the local culture, this holiday stayed much the same as it had been for the Olmecs, Maya, and Aztecs. The Aztecs honored the goddess Mictecacihuatl, queen of the underworld. As queen of the underworld, her purpose was to watch over the bones of the dead. Durante siglos El Día de los Muertos se ha celebrado con muchas de las mismas tradiciones. Aun después de la llegada de los españoles y el cambio de la cultura local, esta fiesta se mantuvo muy parecida a la de los olmecas, mayas y aztecas. Los aztecas honraban a la diosa Mictecacihuatl, reina del mundo subterráneo. Como reina del mundo subterráneo, su objetivo era proteger los huesos de los muertos. 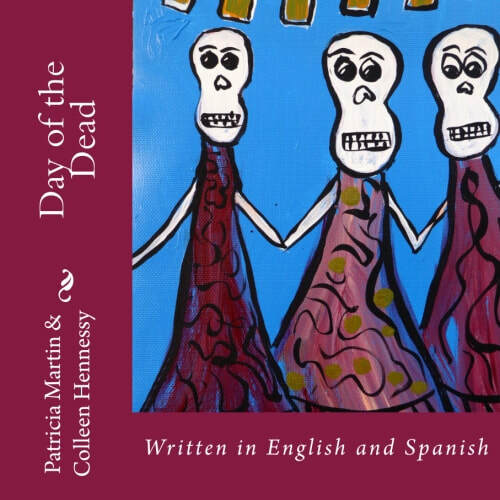 Day of the Dead is written in English and Spanish. It features original paintings by Denver artist Colleen Hennessy. The book is a celebration of art, culture, and history. It makes a wonderful gift for anyone interested in Dia de los Muertos.